Ajax’s European fairytale is somehow still not over. 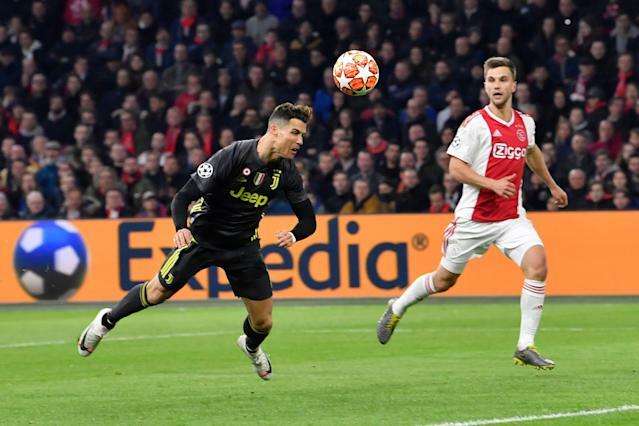 Even though Juventus superstar Cristiano Ronaldo returned from his hamstring injury in time for the first leg of the Champions League quarterfinals on Wednesday, and scored a goal, the underdogs from Amsterdam earned a well-deserved 1-1 tie. That keeps them competitive in Tuesday’s return leg in Turin, where Juve will enjoy a slight lead going into the game, courtesy of its away goal. Remarkably, Ajax did better than it had in the first leg of the round of 16 against Real Madrid, when it lost at home 2-1. But then it romped to a 4-1 win in Madrid, casting Real ever deeper into crisis and pulling off one of the great upsets of modern soccer against the three-time European champions. And so Ajax, four-time winners of this tournament, but a team that hadn’t been to the final since 1996, the quarterfinals since 2003, the knockout stage since 2006 and the group stage since 2014, might yet make their deepest run since 1997. It remains in the realm of possibility, especially given its stubborn reluctance to play any style but the club’s signature untethered, turbo-charged, 90-minute attacking assault. It was this harassing pressure – masking and indeed maximizing the team’s ostensible weakness, its youth, into an overbearing strength – that made Juventus uncomfortable all night. And it largely made Ronaldo a non-factor, but for his goal and a single other shot. Ajax has no reasonable business at this stage of this tournament but nevertheless has lost just once in its nine games in the competition – the aforementioned and ultimately irrelevant defeat to Real. And the soccer world’s inability to see the potential in this uber-talented Ajax team to get this far amounts to a failure of imagination. It’s a manifestation of the cynicism that’s corrupted our enjoyment of a sport of gaping economic inequality, in which the games nevertheless need to be played, even if the outcome seems ordained. Because just often enough, Leicester City wins the Premier League and Ajax threatens to make the semifinals of the Champions League. On Wednesday, Ajax had the upper hand for most of the game, taking its usual possession approach with real forward purpose. Juve didn’t so much sit back and play on central counter-attacks as it lurked on quick transitions that would open up space out wide. The superlative Hakim Ziyech was ever threatening for Ajax, just the same as his forward counterpart on the other side, Federico Bernardeschi. Both tormented the defense with their close skill, movement and swerving long shots. Ajax had the better of the first half chances, with Wojciech Szczesny making a sprawling save on Ziyech’s curler and Donny van de Beek ripping a shot just wide after a liberating turn. But it was Ronaldo, barely noticed until then, posing questions about his match fitness, who launched a counter-attack on the brink of halftime and found a seam in the back line to spring through. He dove onto the end of Joao Cancelo’s cross and put his team ahead yet again. It was Ronaldo, remember, who scored all three goals in Juve’s miracle comeback against Atletico Madrid in the last round. And this goal may continue to repay his staggering salary and the nine-figure transfer fee Juventus wired to Real Madrid for his services this summer, even though the Portuguese was already 33 at the time. But just after the intermission, the revelatory David Neres, Ajax’s Brazilian winger who has gone from bust to making his senior debut for his homeland’s Seleção this season, fashioned the equalizer. He nicked the ball off Cancelo, cut inside and scored with a bending blast through two defenders. Ajax thundered forward in search of the winner, leaving itself ever more exposed to Juve’s counter-punches. That proved all the more risky for Ajax’s failure to convert any of the bushel of chances it created. And in the 85th minute, Juve sub Douglas Costa, tireless in his attacking zeal after coming on for the feckless Mario Mandzukic, bulled his way through the Ajax defense and whacked his finish off the bottom of the far post. Ajax escaped, even though it was, in the end, very good value for its tie. It continues to thrive by doing things in its own, inimitable way. By doing things like bringing on Jurgen Ekkelenkamp for the veteran Lasse Schone in the second half, even though the 19-year-old had never played in this competition and had just four senior team appearances to his name. Ajax doesn’t fear its youth. Not against a team nicknamed “The Old Lady,” ironically. Then there’s this: The last time Juve was the European champion, in 1996, it beat Ajax in the final on penalties. That game was played within a month and a half of the birth of van de Beek and Ajax’s other midfield star, Frenkie de Jong. It would be another two years before its defensive prodigy and captain Matthijs de Ligt was born. Which is all very fitting. Because the run this Ajax team is on is very much once-in-a-generation.